I am currently reading The Swerve by Stephen Greenblatt and it is fantastic in my humble opinion. Many thanks to Jack for the high recommendation. I have just finished the section of the book where Greenblatt tells the story of the great library at Alexandria and the demise of its last librarian, Hypatia in 415 C.E. I was reminded of the above video from Carl Sagan's Cosmos series. There are a few differing details in the two accounts; Sagan says the mob used abalone shells, Greenblatt says they used broken pottery. Either way the scene painted marks a terrible inflection point in history. A woman of legendary beauty and intellect, Hypatia's death epitomized the decay of natural philosophy in the wake of spreading Christian fundamentalism. In the moment of her death as a mob of zealous Christians carved her flesh the pendulum of history began a millennium of descent into fear and superstition. I can not help but think of the current state of natural philosophy here in the United States. 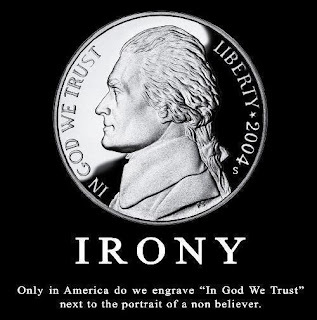 It scares me that people I run into on a daily basis probably are not aware that the inclusion of "under God" in our national pledge of allegiance, the inscription "In God we Trust" on our currency, and the adoption of the same phrase as our national motto all happened in the year 1952! These tacitly Christian phrases were injected into our national identity as a result of McCarthy era fear-mongering. A perceived spread of communism pushed the US government to pass reactionary legislation echoed by the Patriot Act. The founding fathers were more like thinkers in the great library of Alexandria when they adopted the inclusive motto "E Pluribus Unim." My question is, when did our Hypatia die? Today, it is the height of irony to pull out a nickel and see this! Ed Brayton, fellow freethinker and blogger posted this on Facebook a few days ago and it has been resonating in my head ever since. Ed writes the blog Dispatches from the Culture Wars.